With 1.2 million printings for the final book, a spot on the New York Times Bestsellers list, and grossing more than $1,156,413,241 at the box office over the course of three films (domestically), Suzanne Collins’ Hunger GamesTrilogy has shown itself as a force to be reckoned with. Young Adult Literature like Collins’ work along with J.K. Rowling, Cassandra Clare, and John Green have flooded the market, but it’s not just teenagers who absorb the words; adults constitute a percentage of the consumers as well. Even with all of the current focus and hype, the exact date and place where this category came to fruition is unclear. A comeback kid, Young Adult (YA) novels have stolen the limelight from other categories as some of the most popular books today. While there is some dissent on exactly how big the YA market has gotten, publishers have made at least $1.3 billion from sales in 2009 and are adding new authors continually. But what does the niche include, how did it begin, and why is it so popular now? 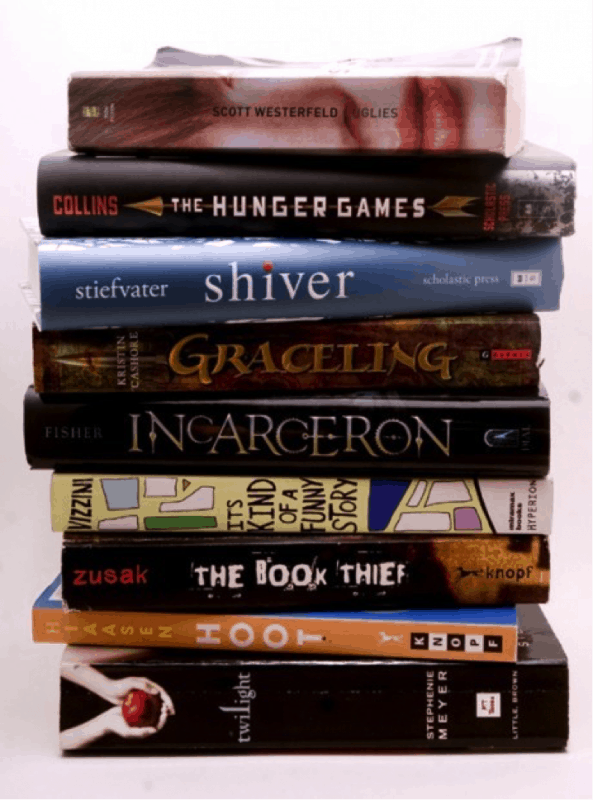 Between Middle School and Adulthood: What is Young Adult Literature? Recognized for their awards in the YA world, The Young Adult Library Services Association (YALSA), a part of the American Library Association (ALA), categorizes a young adult as someone between the ages of twelve and eighteen; however, YA fans and authors generally categorize YA literature for someone ages sixteen to twenty-five. Other similar categories include Teen Fiction, which is supposed to be for ages ranging ten to fifteen. But, in general, the terms young-adult novel, juvenile novel, and young-adult book all refer to texts in the YA literature category. In 2004, Reading at Risk: A Survey of Literary Reading in America showed that young adult readers was dropping at alarming rates, up to 20% between 1982 and 2002. This decline showed over 20 million possible readers, making it a “national crisis” according to Dana Gioia, the National Endowment for the Arts (NEA) chairman, the group that had published the study. Reading programs for young adults sprouted up all over the nation as flowers in spring, showering their incentives on all who would accept them. Coincidentally, as Hannah Wither and Lauren Ross point out in “Young People Are Reading More Than You,” J.K. Rowling’s hit, Harry Potter and the Sorcerer’s Stone, was released in the U.S. in 2000, correlating with a 21% increase in young readership in 2002, one that has continued through 2008. While Wither and Ross cite Rowling’s work as a boon towards Young Adult Literature’s recognition in the wider community, Rowling was not the first to publish books geared towards young adults. Some argue that Young Adult literature as a category began very long ago with what are now regarded as the classics, books written for the common young adult, books ranging fromChaucer’s Canterbury Tales to The Fables of Aesop and Le Morte d’Arthur; a comprehensive list of books created for younger audiences can be found here. Many of these stories were created with young adults in mind, but they had a very different style and purpose than young adult novels today have. One year that stands out is 1967, the year that some say YA Literature unofficially began with the publication of Books and the Teenage Reader: A Guide for Teachers, Librarians, and Parents by G. Robert Carlsen. However, Michael Cart, author and former editor for the Young Adult Library Services Association, has stated that Maureen Daly’s Seventeenth Summer, printed first in 1942, was the first novel written and published specifically for teenagers. Later in the 1970s, America specifically had its first “Golden Age” of YA novels, starting with Go Ask Alice by Anonymous, a short novel supposedly created from the journal of a teen struggling with drugs and finding herself, and continuing its run with Robert Cormier’s The Chocolate War, an iconic text about high school and peer pressure that began some very real debates about YA literature in general. The 1980s signaled a return to romances and series books, which The Hardy Boys and Nancy Drew had begun in 1905. From the 1990s to today, many YA books focus on realism, but recently fantasy and dystopian series like The Maze Runner, Twilight, and The Hunger Gameshave made a return. But what is more, from literary critics to the common reader, almost everyone has a different definition of what exactly makes a book “young adult.” Some argue that every young adult text is a coming of age story, a bildungsroman, that focuses on a loss of innocence, while others posit that young adult simply means that the emotions, ideas, and themes presented are geared towards that 14-early 20s crowd, given in a more simplistic manner. Whatever the case, many would agree that this is a category- not a definitive literary genre- and as such, many books fit within it. Some, like the famous Catcher in the Rye by Salinger, did not ask to be placed in this category but instead were adopted into it because the audience demanded it to be so, having a majority of teen readers who connected with Holden Caulfield’s, the protagonist’s, dilemmas and conflicts. Brewing Controversy Surrounding YA Lit. The audience for YA literature is steadily increasing with more and more options on bookshelves everywhere, but some literary critics are issuing an outcry that some of the audience for these books are adults in their 30s and 40s who have followed the hype from their children and begun reading these seemingly adolescent texts. With more and more YA books being published, some believe that quality adult novels get pushed to the side in favor of their younger, more naive counterparts. Hi, what an interesting and impressive article. Helped me very much with my dilemma. Like the points you have talked about. Unquestionably true!